Payment Mode- Online(Credit/Debit Card/Net Banking) or Offline SBI/PNB/IDBI Bank Challan. Chargeman/Electrician/Supervisor/Operator/Mechanic/Tracer/Generator Attendant- Passed Matric Exam with Hindi or Sanskrit and ITI Certificate in Concerned Trade and 2-5 year Experience in Similar Field. Blacksmith/Motor Winder/Lift/Generator Operator- Passed Matric Exam with Hindi or Sanskrit and 3-8 year Experience in Similar Field. Store Clerk- Passed Matric Exam with Hindi or Sanskrit and 1 year Experience in Similar Field. Store Keeper- Passed Graduation and Studied Hindi/Sanskrit up to Matric Level and 2 year Experience in Similar Field. Salesman- Passed Matric Exam with Hindi or Sanskrit. Section Officer/Account Clerk- Passed B.Com and 1-3 Year Experience in Similar Field and Studied Hindi or Sanskrit up to Matric Level. ASPO- Passed B.Sc AG/M.Sc AG with 2 Year Experience in Similar Field and Studied Hindi or Sanskrit up to Matric Level. Pipe Filter/Jr. Mechanic- Passed Matric Exam with Hindi or Sanskrit and ITI Certificate in Concerned Trade. Asst Accountants- Passed 2nd Class B.Com with 5 yr Experience or 2nd Class M.Com with 2 year Work Experience and Studied Hindi/Sanskrit up to Matric Level. Draftsman Planning/Asst Draughtsman- Passed Certificate in Draftsman/Diploma in Architecture and and Studied Hindi/ Sanskrit up to Matric Level and 0-3 Year Work Experience. Legal Assistant- Passed Graduation and LLB Degree and 2 Year Experience in Similar Field and Studied Hindi/ Sanskrit up to Matric Level. Receptionist/PBX Operator- Passed Graduation and 1 Year Experience in Similar Field and Studied Hindi/ Sanskrit up to Matric Level. Assistant Programmer- Passed Graduation and 1 Year Computer Diploma and 3 Year Experience in Similar Field and Studied Hindi/ Sanskrit up to Matric Level. Assistant Manager- Passed Engg. Diploma or BA/B.Sc/B.Com and LLB with 2-4 Year Experience in Similar Field and Studied Hindi/ Sanskrit up to Matric Level. 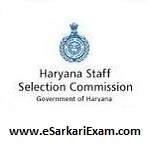 Eligible Candidates can Submit HSSC Chargeman, Asst Manager & Various Posts 2019 Online Application at the Official Website of HSSC Latest by 8th April 2019. Applicants First Open HSSC Official Website. Open Advertisement No. 3/2019 Link. Now Click on URL Link Given in Notification. Now Click on Register Link. Open COntinue to Register Link. Register by Clicking on Proceed Button.